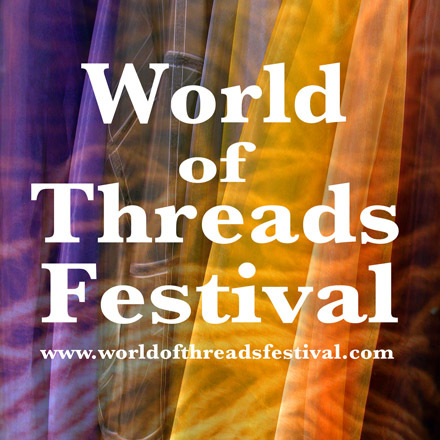 Gareth Bate and Dawne Rudman are curating the 2012 World of Threads exhibition Variegated Threads. The decision to carefully curate our exhibitions with specific themes left many artists unselected. There was so much exciting and unique work that we couldn't bare not to show it! We decided to expand the Festival into the Halls of Queen Elizabeth Park Community and Cultural Centre. This diverse collection of work features 25 artists from Australia, Canada, Ireland, United Kingdom, and the USA. Follow the halls around the gallery to see a huge variety of media from quilts to tapestries to site-specific installations. Australia: New South Wales: Sydney: Denise Lithgow. Jacqueline Treloar, St. Catharines: Barbara Rehus. England: East Sussex: Barn Croft: Ali Rabjohns. Ireland: Co. Wicklow: Kilmacanogue: Cliodhna Quinlan. USA: California: San Francisco: Marie Bergstedt. The Halls of Queen Elizabeth Park Community and Cultural Centre. Oakville's newest cultural centre has just opened in April 2012. 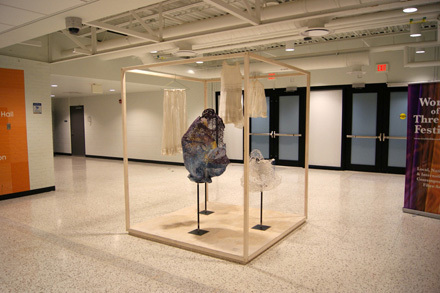 Work will be exhibited throughout the building including the halls, main lobby and open areas.